A SpaceX Falcon 9 rocket launched the company's Dragon cargo capsule toward the International Space Station today, then turned around and nearly pulled off a soft landing on a drone ship in the Atlantic Ocean. The unmanned Falcon 9 rocket blasted off from Florida's Cape Canaveral Air Force Station at 4:10 p.m. EDT (2010 GMT) today (April 14), sending Dragon to orbit on a resupply mission for NASA. SpaceX then attempted to bring the rocket's first stage back down for a vertical landing on an "autonomous spaceport drone ship," in a highly anticipated reusable-rocket test. "Ascent successful. Dragon enroute to Space Station. 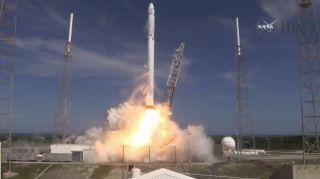 Rocket landed on droneship, but too hard for survival," SpaceX founder and CEO Elon Musk said via Twitter today. "Looks like Falcon landed fine, but excess lateral velocity caused it to tip over post landing," he added in another tweet. Today's launch was originally scheduled for Monday (April 13) but was delayed a day by bad weather. Musk said in the aftermath of the Jan. 10 attempt that the rocket stage's stabilizing "grid fins" ran out of hydraulic fluid. SpaceX addressed that issue and also upgraded the drone ship — which is called "Just Read the Instructions," after a sentient colony ship in the novels of sci-fi author Iain M. Banks — to be more stable in rough seas, company representatives have said. Musk is probably not particularly surprised or disappointed by today's near-miss. On Monday, he tweeted that the chances of landing success were less than 50 percent. While the reusable-rocket test has been grabbing most of the headlines, the main goal of today's launch was to get Dragon aloft. SpaceX holds a $1.6 billion NASA contract to fly at least 12 resupply missions to the orbiting lab using Dragon and the Falcon 9; today's launch kicked off the sixth of those cargo missions. On this trip, Dragon is hauling more than 4,300 lbs. (1,950 kilograms) of food, scientific experiments and other supplies to the space station, including an espresso coffee machine called "ISSpresso" that could provide some much-needed comfort for the astronauts in orbit. "It's kind of like the ice cream thing," Dan Hartman, deputy International Space Station program manager at NASA's Johnson Space Center in Houston, said at Sunday's news conference. "We fly ice cream every now and then. That's just to boost spirits; maybe [on] some rough day, a scoop of ice cream gets them over that hump." If all goes according to plan, Dragon will arrive at the space station early Friday morning (April 17). The capsule will stay berthed to the $100 billion orbiting complex for five weeks, and will return to Earth with a load of "down cargo" in late May. Dragon is the only cargo vessel currently flying that is made to survive the trip back to Earth; all of the others are designed to burn up in the planet's atmosphere. "Five years ago this week, President Obama toured the same SpaceX launch pad used today to send supplies, research and technology development to the ISS," NASA Administrator Charles Bolden said in a statement after today's successful launch. "Back then, SpaceX hadn’t even made its first orbital flight," he added. "Today, it's making regular flights to the space station and is one of two American companies, along with The Boeing Company, that will return the ability to launch NASA astronauts to the ISS from U.S. soil and land then back in the United States. That's a lot of progress in the last five years, with even more to come in the next five."